Our Mission: Through research, practice and training, the Patient Navigation Services Program seeks to ensure all Louisianans receive quality, standard cancer care and prevention services. LCPCP began the Greater New Orleans Patient Navigation program in May 2008 to provide low-income uninsured cancer patients with emotional, educational and practical support. The Greater New Orleans Patient Navigation Partnership (GNOPNP) provides low-income, under insured and uninsured cancer patients with emotional, educational and practical support. Patient navigation is a service provided to cancer patients to overcome or ameliorate barriers to successful treatment. The goal of the patient navigation program is to facilitate timely access to quality, standard health care in a culturally sensitive manner for all cancer patients. The Greater New Orleans Patient Navigation Network meets monthly at the LSU School of Public Health. The meetings are open to other organizations interested in learning more about patient navigation, networking with other navigators, or to present research findings resulting from patient navigation. If you would like to attend a patient navigation meeting, please contact Mack Giancola or Dana Feist. By providing emotional support and guidance to patients. Throughout treatment the navigator works to ensure patients link with the health system, community resources, programs, and agencies as needed to eliminate barriers across the continuum of care to achieve an optimal clinical outcome. 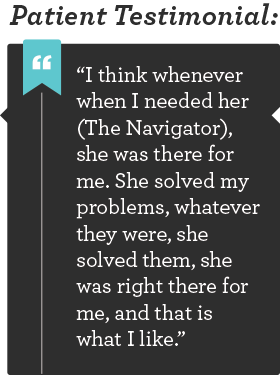 Since 2010, the LCPCP patient navigator has navigated more than 650 cancer patients. Over 75% of those patients are Free Care or they qualify for Medicaid. Anesha Williams- Oncology Treatment Patient Navigator, whose previous professional experience with the Louisiana Tumor Registry, inspired her to want a more hands on approach to assisting those with cancer. Anesha became the first navigator at Interim LSU Hospital (thru a partnership with LSU School of PBH and ILH) in July 2010, and from the start was able to help reduce or eliminate many barriers cancer patients face while going through treatment. The Louisiana Breast and Cervical Health Program staff provides navigation to patients within the facilities it funds using existing staff to navigate uninsured and underinsured women within the facility. Every woman with an abnormal breast or cervical screening is navigated to ensure a definitive diagnosis is arrived at within sixty days of the abnormal finding. Ensuring that all abnormal screenings receive follow-up care within the clinical guidelines is critical. Of the abnormal findings, the LBCHP achieves a definitive diagnosis within the guidelines to over 95% of those patients with abnormal findings.